I got to lead a friend's ceremony. Here's what I learned about the process. Leading a marriage ceremony is an honor, and you don’t have to be a professional. Plus, it’s becoming more common for couples to look to their inner circles for wedding officiants. About 47% of couples had a friend or family member officiate at their wedding in 2017, up from 29% in 2009, according to online wedding-planning marketplace The Knot. But make sure you know what’s expected as an officiant. Here’s an overview with some expert advice and my own experience. Check in with the couple. Confirm whether you’re making their marriage legal. Otherwise, you might do a symbolic wedding and the couple would need to go to city hall for the real deal. Get certified. Research what’s required in the county and state where the wedding is. One option, if available, is to be certified as a deputy marriage commissioner by the local civil authority, such as a county clerk's office, by signing a few documents in person and paying a fee. Or get ordained and, if required, register. Another method is getting ordained online as a minister by a nondenominational organization such as the Universal Life Church. Some states, such as Virginia, don’t accept online ministers as officiants, but most do. And, if necessary, be sure to register with the local marriage authority. Being ordained by ULC, for instance, is free, but it’s about $30 to get official documents mailed. If registering, you might need the documents, as well as a copy of the marriage certificate, as part of the application. My experience: There was an $80 fee to be certified as a one-time deputy marriage commissioner in Santa Clara County for my friends’ wedding this spring, and the couple covered it. My experience: The price tag was $500. The bride and groom preferred that I wear a dark gray suit since their groomsmen would be in light gray. 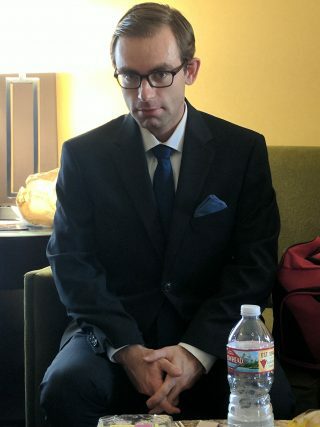 I bought a suit online, had it shipped to a nearby Men’s Wearhouse and got it tailored. I took advantage of a department store sale to get a new belt, pocket square and pair of shoes. Book travel early and strategically. Aim to be close to the wedding party’s hotel and the venue, and be there for the dress rehearsal. “I would almost think of the friend officiant as a hybrid, as a wedding guest and a wedding party member,” says Ivy Jacobson, senior digital editor at The Knot. My experience: I spent only $50 on all travel expenses. Local weddings rock. I live a train ride away from the county where my friends held their wedding, and I shared rides and a hotel room with two of the groomsmen, who are college friends of mine. Write and practice saying the wedding script. The must-have to make the ceremony legal is the declaration of intent (“Do you take...I do.”), and you’ll probably want to have the pronouncement (“I now pronounce you…”) too, which some states specify as required. Otherwise the script is up to you and the couple, if they wish to participate. Check sample scripts online and personalize. Also ask what the couple wants for the length, whether they’ll have their own vows and if they request any readings. My experience: I spent 10 hours over a few weeks writing and editing multiple drafts of the script. I emailed the couple a few questions and visited with them. On the wedding day, I read the final version aloud several times to the groomsmen in the hotel room. Know the logistics. Confirm whether you’ll have a mic, and know where you’ll stand and any cue if you’re walking onto a stage. Sign the marriage certificate. Once the ceremony ends, there might be a few signatures needed on the form besides the couple’s: yours as the officiant and one or two witnesses from the ceremony. The requirements vary by state. Then mail in the certificate to the appropriate civil office promptly after the wedding. Don’t feel obliged to give a gift. Being an officiant at a friend’s wedding is typically unpaid, so you’re saving the couple money. The national average cost of an officiant is $284, according to the Knot’s 2017 Real Weddings Study. "Officiating over the wedding is a gift in itself,” Jacobson says.